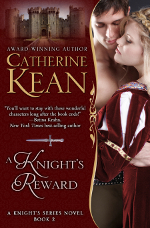 For this week’s Medieval Romance Monday we are featuring A Knight’s Reward by award winning author Catherine Kean. A Knight’s Vengeance is the second book in Catherine’s A Knight’s Series. You can read a sample excerpt of A Knight’s Reward right here on Medieval Romances. This entry was posted in Medieval Romance Monday and tagged catherine kean, medieval romance monday. Bookmark the permalink. Thanks for being a guest on Medieval Romance Monday!